Phnom Penh Municipal Court on Wednesday sentenced Som Ek, leader of the Tiger Head Movement, to an additional two years in jail over his escape from prison in 2016. Judge Seng Leang said Mr Ek, 44, was charged with escape from prison in Phnom Penh after being on the run for 16 days before being re-arrested in Siem Reap province on October 26, 2016. Judge Leang said that at about 2am on October 8, Mr Ek, who had pretended to be ill and was being treated at the Khmer-Soviet Friendship Hospital, drugged prison guards at the hospital by putting sleeping pills in their food and drinks. Judge Leang added that after his re-arrest, he was transferred from the Siem Reap provincial jail to Prey Sar prison in Phnom Penh. Mr Ek declined to comment on his sentence. 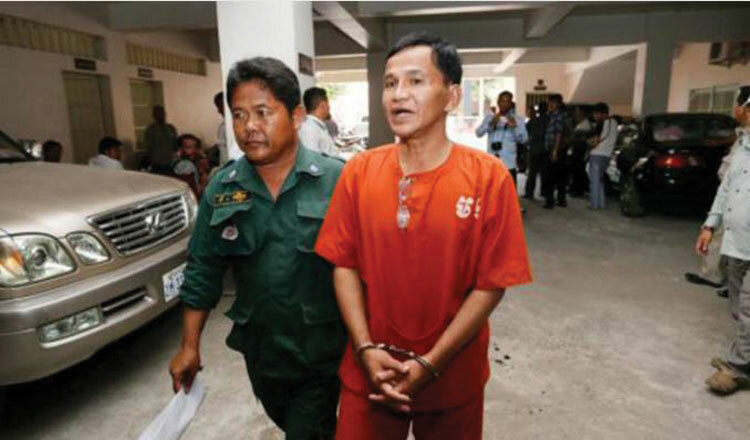 According to a court document, Mr Ek was on January 10, 2009, arrested in Banteay Meanchey province for planting bombs at the Cambodian-Vietnamese Friendship Monument in 2007 and at the Defence Ministry in 2009. In 2010, the municipal court sentenced Mr Ek to 28 years in prison after finding him guilty of planting the bombs and recruiting and training terrorists.